As you grow older and gain more responsibilities, you may find that you become less organized. As you add children, the problem can only grow worse. Likewise, if you and your spouse both work full-time, you may feel you have even less time to do what you need to do and still spend time with your family. 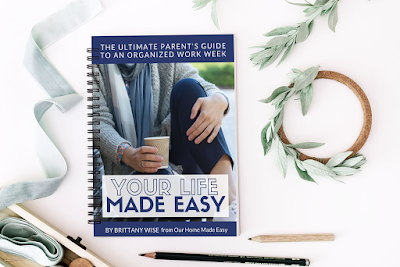 Brittany Wise, a full-time industrial engineer and the woman behind the blog, Our Home Made Easy, knows just how you’re feeling because she used to feel that way, too. Wise and her husband both work full-time and have two young children. Over the years, they’ve developed several systems that help their lives run smoother, which Wise shares in her eBook, Your Life Made Easy: The Ultimate Parent’s Guide to an Organized Work Week . Each part has between two and eight chapters. The chapters are one to three pages long and end with either a thought to consider or an action to take. The layout of the book is visually appealing as almost every page includes a picture, and Wise uses blue for the action steps as well as the chapter titles. While some books like this have particular action steps that you build on with each lesson, this book does not. There are some action steps, but the book’s main point seems to open your mind to the ways you could be doing things differently to be more productive and get done what you need to. Who Is Your Life Made Easy Right For? However, if you aren’t in this stage but you still have children at home, you, also, can likely benefit from this book. I no longer have young children, but I do still have children at home, and there were tips that I could use. I especially appreciated the tips for when your spouse is out of town as well as the meal planning tips and finding a hobby that benefits you in a variety of ways. If your children are grown, this book likely won’t be as useful for you. What Can You Expect to Gain from Your Life Made Easy? Much of this book is based on Wise’s own experience, so likely not all of her tips will be useful for you. However, there are so many tips in here that even if you pick and choose, you will likely find many valuable ideas. Part of how Wise is able to complete so much every day is because she and her husband have a partnership and share the load evenly. Unfortunately, this is not true for all couples, so some might be frustrated when reading this book. If you’re feeling overwhelmed and exhausted by your current schedule (or lack thereof), Your Life Made Easy will likely help you run your life a bit more smoothly and free up more time for you to find precious “me” time.